ALLISTON, ON, Feb. 8, 2019 /CNW/ - Forests Ontario's Annual Conference took place on February 8th at the Nottawasaga Inn in Alliston, Ontario. Ontario's largest forestry conference, the event brought together more than 400 forestry enthusiasts from across the province for discussions and presentations under the theme of Natural Connections. 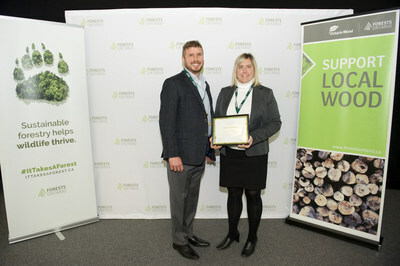 The conference featured an awards ceremony recognizing groups and individuals that have made outstanding contributions to Ontario forestry. The Ontario Wood Award is presented to an individual or organization that has contributed to the positive promotion of the Ontario Wood brand. Ontario Wood – a Ministry of Natural Resources and Forestry program – encourages consumers to choose products made by local artisans using locally sourced wood. This year's recipient was Sacha Gendron, in recognition for her efforts to promote the importance of local wood products, and their role in reducing waste and carbon sequestration. Through her partnerships with Ontario Wood product manufacturers and local environmental groups, Sacha leads demonstrations for students across the Greater Toronto Area and shares her work through social media under the handle @CuttingEdgeSacha. "Sacha is the perfect ambassador for local wood in 2019," says Rob Keen, CEO of Forests Ontario. "She's a young woman who's not only passionate about her work, but who also proactively engages the broader community, especially students, in understanding the advantages of wood as a building material and the importance of supporting local entrepreneurs." The 2019 Green Legacy Award recognizes a corporate partner whose work has been instrumental in ensuring a green legacy for future generations. 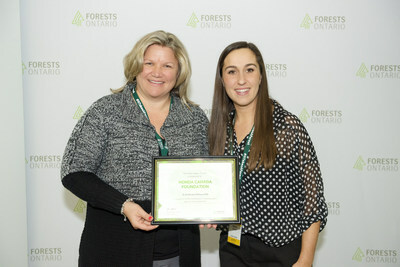 It was presented to the Honda Canada Foundation, a long-time partner of Forests Ontario (through its national planting division, Forest Recovery Canada), for making Canada greener through their One Honda. One Tree initiative. Through One Honda. One Tree, a tree is planted for every Honda lawn mower, tiller, or trimmer sold between April and July. The initiative is responsible for planting more than 100,000 trees across five provinces. These plantings have enhanced forest connectivity, wildlife habitat, and human access to green spaces. Honda has also engaged their employees and supported Forests Ontario simultaneously by participating in Community Tree Plant events, bringing out hundreds of their employees to plant trees. Susan Wiecek Award—Virginia deCarle (deCarle Forestry Services), for outstanding contribution to forestry education in Ontario. Robert de Pencier Award—Dave Taylor (Lands & Forests Consulting, presented posthumously), for outstanding activity in private forest management and support for forestry promotion, education and understanding. Forests Ontario Award—Al Corlett, for achievements and contributions to forestry education in Canada and the world. This award recognizes the continued practice of the highest principles of professional forestry in education, management, research, land use, and forestry awareness. Most Valuable Planter—Toronto and Region Conservation Authority, in recognition of contributions to healthy, natural ecosystems through tree planting initiatives. Forests Ontario would like to thank all attendees, speakers, and sponsors for making Natural Connections a massive success. Forests Ontario is the voice of our forests. Working to promote a future of healthy forests sustaining healthy people, Forests Ontario is committed to the re-greening of Ontario through tree planting efforts on rural lands and in urban areas, as well as the renewal and stewardship of Ontario's forests through restoration, education and awareness. Visit www.forestsontario.ca or follow us @Forests Ontario. Similar to Foodland Ontario, Ontario Wood is a way to connect with a local wood producer. Whether your choice is made based on quality and price whether it's about supporting local producers and local communities, whether it's about what's best for the environment, or whether it's simply because you love the natural beauty of wood products — Ontario Wood can meet your needs. Visit www.ontario.ca/wood.